One good day a work mate approached me with the good news that he had an old radio that may interest me. He played it down, telling me that it was in bad shape, but maybe I could use it for parts. And then he brought me this somewhat damaged and dirty, but nevertheless beautiful sample of early post-war Dutch technology! The Philips collectors among you probably know that the first figure in the Philips model number indicates the quality level of a set. Well, this is a 9! It's the top-of-the-line table radio of 1947! It employs a rather complicated circuit, with a pentode RF preamplifier (EF9), a separate oscillator and mixer in a triode/hexode combination tube (ECH4), then comes an IF amplifier and detector using an EBF2, followed by a pentode (!) audio preamplifier (another EF9), and the audio power amplifier with Philips' well known and much feared multiple feedback (EL3). The rectifier is an AZ1 with a 4V filament, and of course there is a dual-action magic eye (EM4)! The radio offers continuous coverage from 520kHz to 22MHz in three bands, loudness compensation, and delayed action dual AGC! The tuning mechanism employs a clever automatic reduction drive that serves as a bandspread for short wave. I tried hard to get some spare palisander veneer, but didn't find any. Faced to the decision of replacing it by some different wood, or trying to preserve it, I opted for the latter. I glued back on whatever was left of the palisander, and filled the gaps and edges with a tinted wood filler. The result is far from perfect, but if some day I find a better way to fix this, at least all original wood I got is still there. But heavy rotting was not the only problem. Termites had attacked this radio! 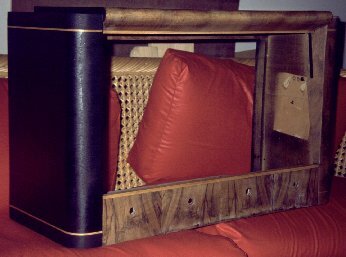 They were unable to eat through the very hard palisander, or perhaps it just tastes bad, but they ate up almost all of the soft wood below, and made lots of tunnels through the veneer on the radio's top, which seems to be makore wood. On this close-up photo you can see a few of the hundreds of termite holes I had to patch! By the way, you can also see how little of the original finish remained in place. This radio was in for a total stripping and refinishing, no doubt. But first I had to get rid of the termites. They were still alive and happily eating my radio! And I didn't want them to spread into my other radios, furniture, the floor... So the first thing to do was removing everything nonwooden, then packing the cabinet into an hermetically sealed plastic bag, and breaking an ampoule of lindane inside. That's a very strong poison, and pretty much the only poison powerful enough to get rid of these radio-eating beasts! I left the radio in the bag for an entire month, so the toxic gases could thoroughly impregnate the wood and kill off all the insects. Then I opened the bag, caring for ample ventilation in order to avoid following the termites into the grave, and let the radio exude the odor for another month. Only then could the repair work start. Meanwhile I started the electronic repair. 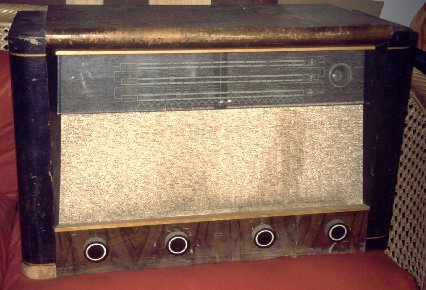 This radio had gone through several repairs during its lifetime, obviously showing that all efforts had been made to keep it running in times when spare parts were hard to get. The best example of this can be seen in this photo. 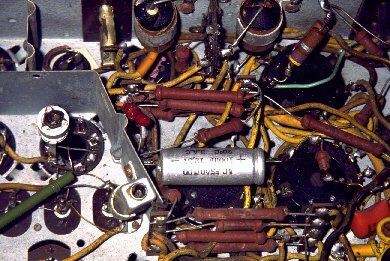 At some time the output tube failed, and some radio technician, unable to find an EL3, simply used the ubiquitous EL84, a very much more modern tube with miniature pinout. He cut the base from an old P-type tube, mounted a miniature socket on top of it, and inserted the EL84. He did not touch the wiring, so returning the radio back to original condition was as easy as locating an original EL3, and plugging it in! Actually the tube I got is an EL3N, an improved and slightly fatter version of the EL3. If you ask me, it's close enough! But this wasn't the only change. 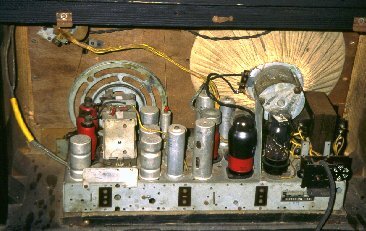 The original EF9 RF preamp tube had been replaced by an EF6. While they look alike and are pin-compatible, they behave very differently! The EF9 is a variable transconductance pentode designed for using AGC, while the EF6 is a sharp-cutoff pentode designed for fixed-bias applications! Of course, this made the AGC of the first stage work very badly, and the genius who did the tube replacement opted for simply eliminating that AGC!!! He did it so nicely that I was puzzled for over a year, until finding out! One level of AGC, at the IF tube, remained, so the radio basically had some AGC, but not nearly enough. I had to connect the antenna for short wave listening, and unplug it for medium wave reception, otherwise the radio overloaded and distorted badly on strong local stations. Here is the full tube complement of the radio. The EL3N is new, added by me to replace that ugly EL84. The other tubes are those that were in the radio when I got it. However, later I replaced the EF6 by a real EF9, and I also had to replace the magic eye, which was badly worn. I found exact original replacements for all of those! 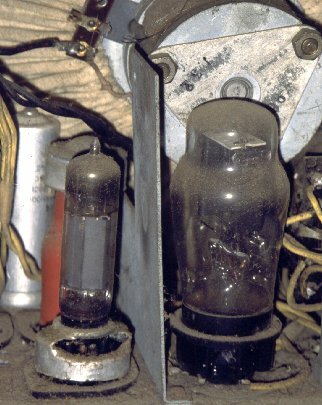 American collectors may not be familiar with these tubes' sockets. They have no pins, but side contacts! These are the famous P-type sockets, in use in Europe from the late 1930's through the late 1940's, and for some specific tube types even into the 1950's! This radio is particularly nice in that it employs a complete series of P-type tubes! Look closely at this photo. Note the trimmer soldered over the coil base, and note the square coil shield clamped with a capacitor bracket. This is yet another modification the radio underwent! The broadcast band oscillator coil must have failed, and instead of fixing it, some technician simply removed it, and used a totally different, newer and much smaller coil - the one you see here. The modification works correctly, so I did not change it, but I would love to get an original Philips oscillator coil, to patch the gaping hole in the chassis! Note those black paper capacitors in the upper part of the photo. They are encased in tar, and all of them were leaky. After the first one burnt up, I got the message and replaced them by plastic caps. I left the original ones in place, disconnected, and hid the plastic caps behind them, as well as possible. The same was true for all electrolytic capacitors: Not one was still usable. Here's the inside of the radio, after repair. The white (well, sort of white) cloth over the speaker adds to the typical Philips look. I could not wash this cloth, it was much too damaged. So I kept it in original, dirty condition! But before I arrived at this stage, another hard work had to be done: The audio stage was distorting badly. I traced the problem to an open feedback winding in the output transformer. Now this is really bad news! There is no way to get such a special audio transformer nowadays: It has a primary winding, a secondary winding, a compensation winding, and two independent feedback windings, all of very specific characteristics. And it is potted in tar, sealed into a soldered steel box! I know of no other hobby collector who even attempts to fix such a case... But I did! Yes, I know, I'm stubborn! So, I removed the transformer from the radio, unsoldered the steel box, took the tar clump out, melted it, poured the tar off, collecting it in a tin. Then I disassembled the iron core, and started opening the windings. Well, you probably know that audio transformers use to have many thousand turns of very thin wire, and I was fully expecting having to unwind and rewind the entire thing. But then a large dose of luck came to my help: The bad winding was the uppermost one! I removed the 520 turns of #46 wire... yes, 46-gauge! It's much thinner than a human hair!!! Of course, I could not get it off in one piece, I rather had to remove it in chunks, and then do some detective work to determine the amount of turns. Then I made the new winding, using #42 wire, which was the thinnest I could get. Fortunately, there was enough space. Before repotting the transformer, I tried it in my radio. I had written down all connections, but of course I could not know the proper phasing of the repaired feedback winding. So I just picked a phasing, and of course, by Murphy's law, got it wrong and produced an audio oscillator instead of a radio. Then I inverted the winding, and.... wow! This radio has the best sound of all in my collection!!! But I like things in the original way. So I had to repot the transformer. I placed it in its steel box, and heated the tar. I warmed the transformer too, so the tar would not solidify too quickly. I heated the tar quite a lot, so it would flow nicely, and I warn you that this is a stinky business. Then I poured it into the steel box, but some vapor caught the flame, and immediately I had a burning torch! I ran with the burning transformer into the kitchen, grabbed some aluminum foil and used it to asphyxiate the fire. No damage had been done, just a very small amount of the tar had burnt away. But the smell!!! Running through the entire home leaving a black cloud of tar smoke behind was a dumb thing to do! It took half a year to get that hellish smell out of my home! Everything had soaked up that stink! So, here is the cabinet. After killing the termites, I sucked their remains away using a vacuum cleaner applied to the holes. After this procedure, the cabinet was extremely lightweight! 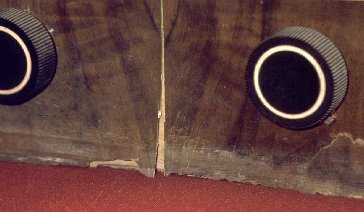 There was almost no wood remaining below the veneer. I had to fill it with epoxy resin. I used more than one liter of resin! Then I filled the damaged areas at the outside, like the lower black rounded corner in this photo. The stripping was done next, followed by applying carbon-based black paint to the sides, leaving two natural colored strips free of carbon. This photo shows the cabinet when one side already had its black cover, while the other bears only remains of the original paint, left over from the stripping process. After all black paint had been applied, I simply brushed shellac over this radio. The original finish was sprayed lacquer, but considering that my repair of the palisander area is very provisional, and I intend to redo it in some better way, I applied just the easily removable shellac. 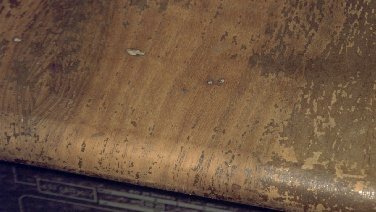 If I, or someone else, one day decides to make a better repair, at least it will be possible to remove the shellac easily and without any further damage. And this is the end result. The main weak spots are the patched, but not really repaired palisander veneer at the bottom, and the disaster that happened with the speaker grille cloth. Yes, it was a real disaster! The first photo on this page lets you see how dirty it was. And it was firmly glued to a backing plywood plate. So, at first I tried to use carpet cleaning foam to get the dirt off. It did not help at all. So, I had to undertake the risky business of removing the already damaged cloth from the wood, and wash it. I soaked wood and cloth in water, which loosened the glue, so I could remove the fabric. I then washed it in cold water, using mild detergent, being very careful because the fabric was really weak, sunburnt and thinned. The dirt came off nicely. Then I stretched it as much as it would go, because it already looked much smaller than it had been! But I couldn't stretch it much, because it was almost ripping. Once it had dried, the nasty surprise came: The fabric had shrunken so much that there was no way to cover the entire opening! I could not get any replacement fabric that looked reasonably alike. So I glued it back on, for the moment at least, but at the top you can see the frayed edge. 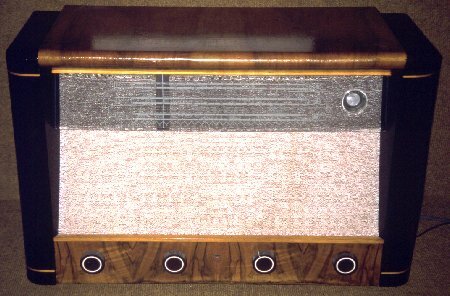 If anyone can get me a piece of original 1947 Philips speaker grille cloth, I would be thankful! My e-mail address is on the main homo ludens page! This radio is now 100% usable and very enjoyable. It has a great sound, and an incredible sensitivity! It hears the entire world, 24 hours a day, using just a 1m long piece of wire as an antenna! It actually hears well enough to enjoy music on short wave! Even my modern Kenwood doesn't do that! My thanks go to Ramón Huidobro for giving me this radio, and to Gerard Tel for getting me some info on this set and helping me understand what had happened to it. More recent research seems to make this radio a little bit older than I originally thought. It seems that Philips kept producing radios all through the war, with a high end line including the models 914X and 915X from 1940 to 1942, and the 916X from 1943 to 1945. At least, other collectors say this. Indeed, recently I saw Philips radios made in 1947 that use the newer line of tubes! As a consequence, I would re-date this 916X-10 export model to 1945, just when international business could (and needed to!) resume, and before Philips could switch to the newer tubes.